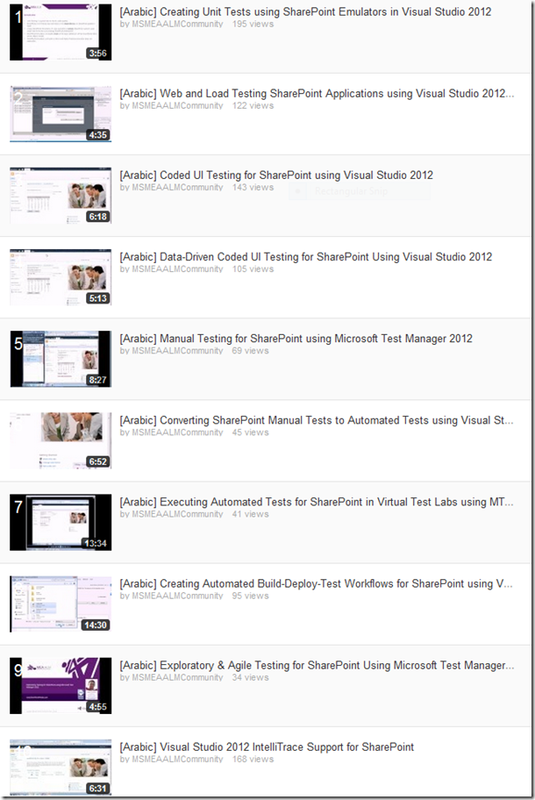 ”The SharePoint Testing & Troubleshooting using Visual Studio 2012 Arabic Video Series” – Updates & Asks! Now that I’m done with the whole video series, I have some updates, thoughts and asks that I’d like to share with you. Updates: I’ve updated the YouTube Playlist and reordered the videos so that the whole series makes more sense for those who are not that familiar with Visual Studio ALM. Asks: I’ve received many messages through email, Facebook & Twitter from non-Arabic speakers asking for the same series in English; some asked for a series of blog posts while others asked for videos in the same way I created the Arabic ones. I’d like to gather more feedback about this, what would you like to see ? Previous PostTop SharePoint Influencers – From the European SharePoint ConferenceNext PostVisual Studio 2012 Update 2 Introduces SharePoint 2013 support for Coded UI Testing!